Steve has never been a big fan of roast turkey. It is such a difficult thing to get right, what with the size, its tendency to dry out and the bands of sinew and tendon in the legs. The solution is to brine your turkey first, then it will remain moist and take on extra flavour. 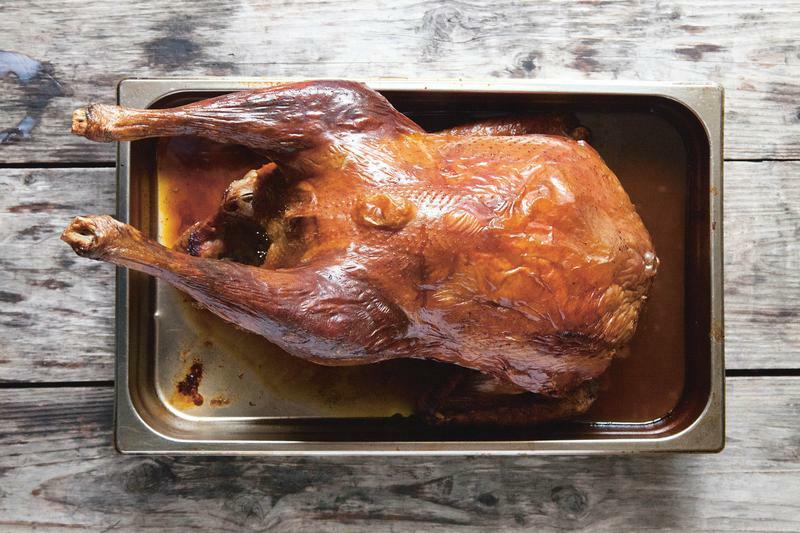 This is loosely based on a traditional American Thanksgiving recipe (leaving out the usual practice of deep-frying the brined bird before serving). Place all the ingredients for the brine, including the herbs, lemon halves and vermouth, if using, in a stockpot and bring to the boil, stirring often, to encourage the salt and sugar to dissolve. Remove from the heat and allow to cool completely; leave overnight if possible. Put the turkey into a food-standard brine tub, pour on the brine and place a plate or something similar on top to keep the turkey submerged. If you can get the tub in your fridge, do so. If not, put it in a cool place, such as a pantry. Keep your turkey in the brine for 24-36 hours. Remove the turkey from the brine, rinse it well under cold water, then pat dry. Let it rest, uncovered, in the fridge for at least 3 hours. Cook the turkey as per your instructions. Alternatively, preheat the oven to 220°C/ Gas mark 7 and roast the turkey for 40 minutes (this initial blast is to get the heat right into the bird), then lower the oven setting to 170°C/Gas mark 3 and cook for a further 3 hours or until the internal temperature reaches 70°C. Check by placing a meat temperature probe in the thickest part of a thigh. To be fancy, you could cure some of your own bacon and wrap the turkey breast in it.